Washington – After states have spent years grappling with the problem, Congress may finally address the epidemic of heroin use and abuse of prescription pain killers which has affected Connecticut and the rest of New England more than much of the country. “Most of New England is in a public health crisis,” said Pat Rehmer, senior vice president at Hartford Health Care. Opioid addiction claimed more than 380 lives last year in Connecticut, even as the state has taken some steps to tackle the problem. One is the establishment of a prescription drug registry that requires pharmacies to enter information about certain prescriptions they have filled in a web-based system to provide patient information to doctors and other pharmacists. Connecticut has also expanded the use by first responders of the drug Narcan, a drug the quickly reverses the effects of an opiate overdose. Congress may now act to give states like Connecticut more resources. The Senate Judiciary Committee held a hearing Wednesday to review legislation that has bipartisan support but has not moved forward. That may change this year, key lawmakers said. “At today’s hearing, the committee hopes to learn more about this terrible epidemic, what’s being done to address it, and how Congress can help,” said Sen. Charles Grassley, R-Iowa, the head of the Judiciary Committee. Grassley said he wanted to learn more about the Comprehensive Addiction and Recovery Act, introduced last year by Sens. Sheldon Whitehead, D-R.I., and Rob Portman, R-Ohio. The bill would give states new grants to combat the heroin and prescription drug epidemic and would direct the U.S. Department of Health and Human Services to convene a “Pain Management Best Practices Inter-Agency Task Force” to develop guidelines for pain management and prescribing pain medication. There’s also the Opioid and Heroin Epidemic Emergency Supplemental Appropriations Act, introduced by Sen. Jeanne Shaheen, D-N.H., that would authorize the immediate spending of $600 million on government agencies tasked with research, intervention and recovery. Witnesses like Vermont Gov. Peter Shumlin urged lawmakers to act. “It’s about time that Congress passes meaningful and comprehensive legislation to address the pervasive damage that opiates are causing in our communities,” he said. Michael Botticelli, director of the Office of National Drug Control Policy and known as the White House’s “drug czar,” testified heroin use and deaths involving heroin use are rising significantly throughout the United States among men and women, in most age groups, and regardless of income level. He said that since 2007, there has been a 340 percent increase in heroin-involved overdose deaths, from 2,402 in 2007 to 10,574 in 2014. Mexican drug traffickers are primary suppliers of heroin to the United States, producing the drug in Mexico and smuggling it into the United States. Botticelli said the purity of that heroin has been on the rise while prices have remained low. “This increase in purity permits heroin use by snorting or smoking, which broadens the drug’s appeal to a population that previously was disinclined to inject the drug intravenously, “said Botticelli, a former director of substance abuse services at the Massachusetts Department of Public Health. He also said drug dealers are adding fentanyl, a powerful synthetic opioid analgesic, to heroin without the buyers’ notice. “Since fentanyl is more potent than heroin, its use increases risks for overdose death, even among individuals who are chronic opioid users,” Botticelli said. Last summer, Botticelli’s office distributed $2.5 million to the nation’s “High Intensity Drug Trafficking Areas Program” to develop a strategy to respond to the heroin epidemic. Connecticut belongs to one of the high intensity drug trafficking areas with the rest of New England. The other areas are Appalachia, New York/New Jersey, Philadelphia/Camden, and Washington/Baltimore. The increased use of heroin has been blamed partly on the increased popularity of pain killers. When prescription opioid medication is too expensive or prescriptions too difficult to obtain, people sometimes turn to heroin, which is now is a cheaper opioid. Several witnesses, and lawmakers, criticized doctors for overprescribing painkillers. “Don’t pass the stuff out as if it’s not a problem,” Shulmin said. On Wednesday, Sen. Richard Blumenthal joined four other Senate Democrats who suggested the Centers for Disease Control and Prevention has been influenced by the pharmaceutical industry and stalled on releasing final guidelines for prescribing opioids, expected at the end of January. No one really knows for sure why the use of heroin and the abuse of prescription pain killers has spiked in Connecticut and the rest of New England. The U.S. Department of Justice says the New England High Intensity Drug Trafficking Area includes 13 counties in six states, including Fairfield, New Haven and Hartford counties in Connecticut. “We’ve been particularly hard hit,” said Rep. Elizabeth Esty, D-5th District, who belongs to the Congressional Addiction, Treatment and Recovery Caucus, which is focusing its efforts on opioid addiction. To Rehmer it’s the geographic location of these states and their proximity to main waterways. She said she’s seen an increase in overdoses in Connecticut “year after year,” especially since 2010. Rehmer also blames doctors for overprescribing pain killers. “It’s not unusual for a doctor to give someone 20 or 30 Percocets for a tooth extraction,” she said. Rehmer also said the cost of heroin is cheap in most of Connecticut. “If you live in a high cost-of-living place like Avon and a bag costs $15, you are likely to drive to Hartford and get it for $5,” she said. 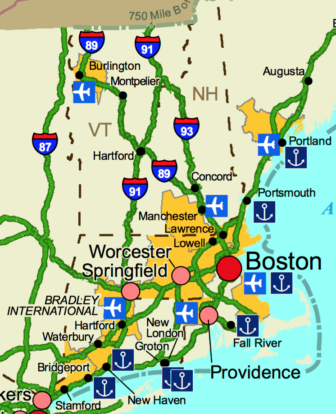 Theodore Cicero, a professor of psychiatry at the Washington University School of Medicine, agrees that New England’s location makes it easy prey for the heroin drug trade. “The closer you are to the ocean, the more likely you are going to see drugs,” he said. Cicero recently wrote an article for the New England Journal of Medicine that determined abuse of prescription drugs has gone down as the use of heroin has risen, a result of higher drug prices and the cunning marketing of cheap heroin by drug dealers. Since many heroin users start their addiction to opioids by abusing pain killers, the large number of physicians and access to medical care in New England has helped boost the heroin trade in the region, Cicero said. “You have a lot of physicians [prescribing opioids] out there, and you have a lot of patients,” he said. Esty, who said about 18 months ago she began to hear from emergency room doctors, police and families who were concerned about a spike in overdoses, agrees. “There’s a significant increase in the prescribing of opioids,” she said.